David Cameron has spoken of the "peace" and "guidance" he finds in his Christian faith. He told BBC Radio Norfolk he wanted Nancy, Arthur and Florence to understand that the festival was more than just "chocolate eggs". 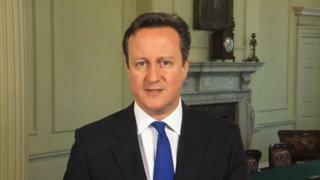 It comes as Downing Street released Mr Cameron's Easter message on YouTube. In it, he says: "Easter is not just a time for Christians across our country to reflect, but a time for our whole country to reflect on what Christianity brings to Britain." He speaks of the "countless acts of kindness" carried out every day across the UK by "those who believe in and follow Christ". "The heart of Christianity is to 'love thy neighbour' and millions do really live that out," he added, praising Alpha courses run in prisons and the "spirit" shown by those who had helped rescue residents during the winter storms across southern England. There is something about political leaders and their aides being asked about their Christianity that leads to memorable soundbites. Or perhaps it is because it is a topic they often avoid and so any reference to it is remembered. Tony Blair's former spin doctor Alastair Campbell was once reported to have batted away a question to the then PM about his faith by saying: "We don't do God." And David Cameron, when he was leader of the opposition, borrowed a Boris Johnson analogy to compare his belief to the signal of a London radio station in the Chilterns. In other words, a bit patchy. Intriguingly, that signal seems rather clearer now. Three times this week the prime minister has talked with conviction about his faith and what he believes Christianity brings to the UK. It's a message from an instinctively "county Tory", a Conservative from a rural background, that will appeal to the party heartlands; where some feel bruised by what they see as liberal, metropolitan concerns such as gay marriage. He said the government had increased funding for the Near Neighbours programme, which encourages members of different faith groups in the inner cities to work together on "social action" projects. Mr Cameron held a reception for Christian leaders in Downing Street on Wednesday, following a day dominated by the resignation of Culture Secretary Maria Miller after a row over her expenses. "The Bible tells us to bear one another's burdens. After the day I've had I'm definitely looking for volunteers," he told the gathering. According to reports on the Bloomberg news service, the prime minister made no reference to gay marriage, a policy overseen by Mrs Miller but which threatened to damage his government's relationship with the Church of England, in his comments. Instead, he thanked churches for the work they did with the poor and urged them to speak up for Christians suffering persecution around the world. He said his "moments of greatest peace" occurred every other Thursday morning, when he attended Eucharist at St Mary Abbots, the west London church linked to the school his children attend. "I find a little bit of peace and hopefully a bit of guidance," he added. Mr Cameron is said to have referred to Jesus Christ as "our saviour" during the talk. In an interview with BBC Norfolk on Thursday, Mr Cameron said he and his children mulled over "what Easter is all about" as they ate breakfast that morning. "I was very impressed with their knowledge about Good Friday and Easter Sunday," he said. "We had a bit of a conversation about that, (that) it wasn't about chocolate eggs. "That was one of the themes at breakfast in the Cameron household." In 2009, Mr Cameron told BBC One's Songs of Praise: "I believe in God and I'm a Christian and I worship - not as regularly as I should - but I go to church. "Do I drop to my knees and ask for guidance whenever an issue comes up? No, I don't. But it's part of who I am." British politicians have traditionally shied away from talking about their own religious beliefs in public, an attitude summed up by Tony Blair's former spin doctor Alastair Campbell, who in 2003 was reported to have said: "We don't do God." Mr Blair was received into the Roman Catholic faith after leaving office and set up a Faith Foundation to promote better understanding between religious groups around the world.